Chicken Stew | Simple and Delicious ! We both finished our lunch and turned towards the hostess. Very delicious biryani! She gazed at us, her eyes expanded. Oh God, really ? Here everyone eats and leaves the place without telling any word! Appreciating some one for some thing always makes significant changes. What we lose if saying few words of gratitude? Start with your kids, parents, wife , husband or other family members. Extend it out of the family. See the difference occur in the relationship. I would regularly get few mails of appreciation from some readers, I read and really enjoy them. Some remains in the memory, that is the power of appreciative words, work as a tonic! My special thanks to the Dr from Calicut, who works in US since 30 years - spent little of his precious time for writing about salkkaaram, Ms Riya from Bangalore who has a helpful mind left a note with few points which are the reason for her love towards Salkkaaram , Nimi and Zeb who are with Salkkaaram from the beginning and to all other readers who visit here.. Grind coconut with couscous in little water to make a smooth solution. Approx. 3/4 cup or water is enough for this. Chop onion, tomato, green chillies etc. When transparent, add garlic and ginger paste. Stir well for few seconds, add chicken, salt, pepper powder, garam masala ,curry leaves and tomatoes. Pour coconut milk and allow to cook. Cook until chicken is done, add more coconut milk if needed. When the chicken is cooked well, pour the blended coconut+coucous solution to that. Mix well allow to boil. Add lemon juice, check salt and remove from fire. Sprinkle coriander leaves on top. Stew looks so so yummy. Drool. I love anything cooked with coconut milk to give it sauce. Slurp! oopa..feel like gobbling..you always present like that seens ..
chicken stew smells here. ha itz really tasty with chappathy. i hv showed this to my partner. and i told your you are my NAATTUKAAREE. i am really proud of in that manner. i am reading all of your new posts. now i am little lucky. my daughter is with me for another 3 months. she cooks any thing for me. we shall try out your CHICKEN STEW this evening. i am still SAD as i could not talk to you or come to your place. i go to my home village next week. kindly gmail me your address, enable me visit your paradise. thanks a lot for releasing new cooking methods. Yeah appreciation is gonna change a lot, Mom says that when theres a mistake too you gotta tell that in an appreciative manner by that way the host/ess will not be hurt and always will turn back to us for more opinions and at the same time we are being true too!!! 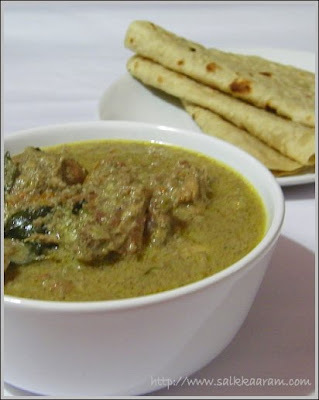 Now to the chicken stew, looks very creamy and delicious, rotis are perfect... Some rice will also help me!!! U have rightly said about appreciating other people. Yummy recipe and beautiful click. How did the curry turn green in color without adding corainder powder?Pls explain. 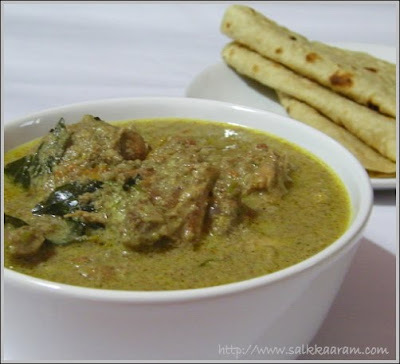 Stew looks so yum... would be perfect w/ chappathi!